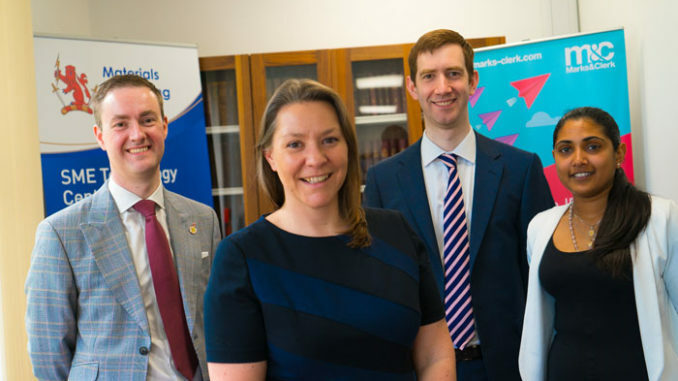 Redcar MP Anna Turley has welcomed a partnership between leading intellectual property firm Marks and Clerk and the Materials Processing Institute that will boost SMEs and start-ups in the North East. Ms Turley officially opened MPI’s unit, which provides expert IP advice and support to SMEs and start-ups engaging in research and development in the region. Businesses from the region, including those associated with the Institute, the Innovate Tees Valley and Tees Valley Business Start Up Programmes, as well as the Federation of Small Businesses (FSB) will be invited to sign up to the IP drop-in service, delivered by Marks and Clerk. Marks and Clerk patent and trade mark attorney, Giles Pinnington, will be based at MPI’s Middlesbrough campus for one day a month, helping companies and start-ups assess how they can bring their business ideas to fruition. IP advice can vary from guidance on what type of IP protection is needed, such as patent application, brand protection or design registration, to helping with filing an application. Giles’ experience covers a range of technologies in the fields of chemistry, chemical engineering and mechanical engineering, including: production and processing of bulk chemicals, foodstuffs, packaging, medical devices, pharmaceuticals and engines. Ms Turley said: “It is great to see this new partnership based at the Materials Processing Institute, which will support innovative and trail blazing companies on Teesside and in our region.